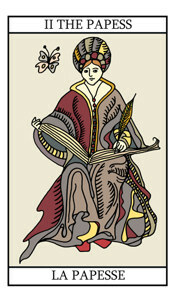 The High Priestess card is symbolic of things being revealed just like a High Priestess pulls a rabbit from his hat. It is a card that is linked to the infinite power of the universe and a lot of emphasis is placed upon mastery, skill and power. This is a card of initiation and communication and mastering the circumstances that present themselves. If you are starting something new, then this is the card for you, as it often represents the determination and initiative needed to succeed at things. This success could be either spiritual or material but either way the High Priestess is a good omen. A stately figure, seated, having rich vestments and royal aspect, as of a daughter of heaven and earth. Her diadem is of twelve stars, gathered in a cluster. The symbol of Venus is on the shield which rests near her. A field of corn is ripening in front of her, and beyond there is a fall of water. The sceptre which she bears is surmounted by the globe of this world. She is the inferior Garden of Eden, the Earthly Paradise; all that is symbolized by the visible house of man. She is not Regina coeli, but she is still refugium peccatorum, the fruitful mother of thousands. There are also certain aspects in which she has been correctly described as desire and the wings thereof, as the woman clothed with the sun, as Gloria Mundi and the veil of the Sanctum Sanctorum; but she is not, I may add, the soul that has attained wings, unless all the symbolism is counted up another and unusual way. She is above all things universal fecundity and the outer sense of the Word. This is obvious, because there is no direct message which has been given to man like that which is borne by woman; but she does not herself carry its interpretation. The High Priestess Card illustration.